THIS IS A SUPER BED IN BAG! It has held up through many washings and has not faded any! I would definitely suggest to purchase this set to friends and family!!! 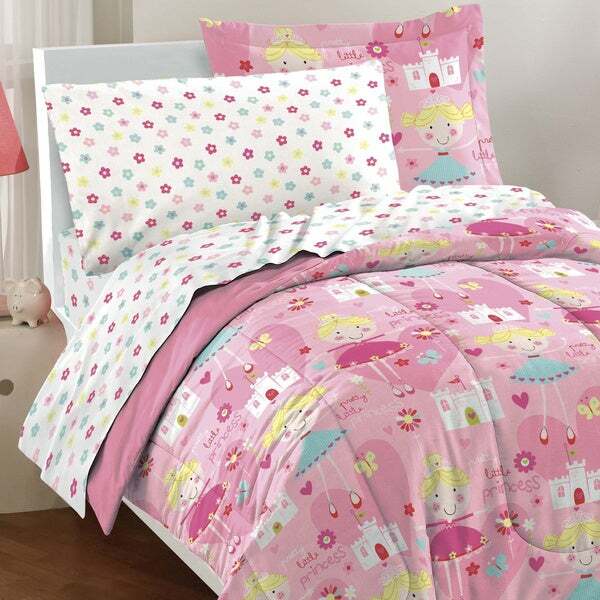 This ultra-soft microfiber comforter set features whimsical cartoon fairy princesses, castles, flowers, hearts, and butterflies on a petal pink ground. A coordinating sheet set showcases colorful tossed flowers on a white ground. LOVE the feel of sheets and comforter! Super cozy. Absolutely love the microfiber sheets and comforter. Feel so comfy against your skin. Super light airy feel to the sheets. This was a big hit with my grand daughter! She could not wait to get these on her own "big girl" bed! I purchased this for my daughters full sized bed. As soon as it arrived I knew that there was no way this was fitting on her bed. the comforter is not a comforter. Its more like a light blanket. the colors were very nice and bright. If your looking for a summer set this is ok but buy it at least one size larger then you want. the picture shows the comforter hanging a few inches off the side of the bed and it was only three. I bought this in conjunction with Magical Princess Twin-size 5 piece Bed in Bag w/ sheet set. I love how they tie together without being an exact match. The colors are bright and girlie. The sheets and comforter are soft and cozy w/o being too heavy. Perfect! Also the details are a lot more fun in person than the picture reveals! Sheets are very thin material but overall the comforter and sheets are cute. I bought 2 sets of these for "the Princess Room" at my house for my granddaughters. The room had previously belonged to my son and was painted a light blue. Rather than re-paint, I added these to the bunk beds and hung pink and white striped valances. I also decorated with princess paintings and wall hangings. The girls absolutely love their room! It was great to get sheets with the comforter set too. So no extra shopping to find something to match. It's a beautiful set fit for a little princess. While the quilt is nice and comfortable, the sheet, pillow case and fitted sheet is thin and cheaply made. I ordered this set for my granddaughters full size bed. It barely fits. The sheets seem a little big and the comforter is short on the sides! Other than that it's cute! My daughter loves this comforter set! It’s really nice and matches her room colors perfectly. The inside of the comforter is nice and soft and love th pillow covers that comes with this set as well. Very thin sheets and comforter. I expected a bit better. Bought this for our daughter. She loves it!!! Wont sleep under anything else now she says. Told us this is the set shes always wanted. So if shes happy, we are happy. This set is so adorable! I purchased it just over a year ago for my little one. My daughter just loves it. The comforter is comfy and warm. What a Great buy. Great quality and price! Our daughter loves the set and sleeps with the comforter every night. my grand daughter loved it. Quality was good. I would highly recommend it. Cute bedding set. Quality is as expected for the price. Ended up returning it and went with a different pattern. For your princess in the making, its perfect!! If you have a little princess in love with with pink and princesses this is the set i would recommend you purchase. "Does this set suitable for college bed??? The extra-long bed in college???" Hello Hurrincy, unfortunately this item is out of stock. We currently do not have inventory to check, and cannot guarantee the item will be restocked. Please keep checking back with us, we update our inventory daily.Thank you for shopping with us. "Does the pretty princess 7-piece bed in a bag with sheet come in full size." Hello sherrician, unfortunately this item is out of stock. We currently do not have inventory to check, and cannot guarantee the item will be restocked. Thank you for shopping with us. My little grand daughter loves pink. "This only shows 5 things in the product details. Can you advise what 7 items are included with this? Thank you"
Hello tlburmood84, this includes a comforter, two shams, (one sham with twin), flat sheet, fitted sheet and two pillowcases (one pillowcase with twin). If you are purchasing a twin set, it will only be 5 pieces, the full size will be 7 pieces. Thanks for shopping with us! A.S.